News Henan Huawei Aluminum Co., Ltd. Location: No.52, Dongming RD, Zhengzhou City, Henan Province, P.R.CHINA. The aluminum circles are used widely in the world. Commercial, easy to produce and high quality makes it very popular in many different countries, especially Asia, South America and Africa. Huawei Aluminum Co., Ltd has been this industry over 15 days and welcome your inquiry and visiting. Aluminum circle, as aluminum disc ,is widely used in making aluminum cookware, as aluminum sauce pan, pizza pan ,utensils application .It is normal with thickness from 0.3mm--5mm,diameter from 100mm-1200mm. Because the speed and quality of the aluminum circles influence the thickness of the cutting, experts often use grinding discs as well. As a rule, the thinner the circle, the faster and more accurate the cutting process. That also means that less material gets used, which reduces the risk of sparking while considerably lowering temperatures. For many machines, circles made of aluminum reduce operating costs with the savings passed down to the customer. Ultimately, using discs in your machinery will enhance performance, yield a higher quality finished product, and save you money. When you are working with a reputable supplier, you can bring your costs down even more. Huawei Aluminum Co., Ltd is both a aluminum Circle manufacturer and supplier with 15 years experience. So factory price is more competitive. Besides, we use the finest raw material to improve the product quality to make sure the quality of our aluminum Circle overtop to national standards. Huawei Aluminum can manufacture aluminum Circle with many tempers, such as O,H22,H14 etc, and we provide customized service according to different customer’s demands. 1050 1060 1100 3003 5052 aluminium sheet is common alloy we main produce, they are widely used in many industrial, Daily necessities, lighting fixtures, reflectors, decorations, chemical industrial containers, heat sinks, signs, electronics, lamps, nameplates, appliances.Industrial pure aluminum has high plasticity, corrosion resistance, good electrical conductivity and thermal conductivity. Henan Huawei Aluminum Co., Ltd is a professional aluminum manufacturer, established in 2001, located in Huiguo Town which is the famous Aluminum Capital in China. There are 1,200 employees, including a R&D team with 26 specialists, and workshop with area of 250,000 square meters. The main product include aluminium sheet,Coil, Sheet, Plate, Circle, Strip and Foil, etc, with the annual output more than 200,000 MT and Export volume accounts for 40%. Our factory produce 1xxx, 3xxx,5xxx series aluminum sheet, If you have related inquiry, welcome to contact us. Medical Aluminum Foil MarketGlobal Medical Aluminum Foil market report 2018 offers a professional and in-depth study on the current state of the global Medical Aluminum Foil industry along with competitive landscape, Market share and revenue forecasts 2024. The report firstly introduced the basics: definitions, classifications, applications and industry chain overview; industry policies and plans; product specifications; manufacturing processes; cost structures and so on. Then it analyzed the world’s main region market conditions, including the product price, profit, capacity, production, capacity utilization, supply, demand and industry growth rate etc. At the end, the report introduced new project SWOT analysis, investment feasibility analysis, and investment return analysis. Overview of the report: The report begins with a market overview and moves on to cover the growth prospects of the Medical Aluminum Foil markets. Global Medical Aluminum Foil industry 2018 is a comprehensive, professional report delivering market research data that is relevant for new market entrants or established players. Key strategies of the companies operating in the markets and their impact analysis have been included in the report. Furthermore, a business overview, revenue share, and SWOT analysis of the leading players in the Medical Aluminum Foil market is available in the report. Markets Status: Combining the data integration and analysis capabilities with the relevant findings, the report has predicted strong future growth of the Medical Aluminum Foil market in all its geographical and product segments. In addition to this, several significant variables that will shape the Medical Aluminum Foil industry and regression models to determine the future direction of the markets have been employed to create the report. Company information Henan Huawei Aluminum Co., Ltd.
Aluminium ingot coil, Aluminium sheet, Aluminium plate, Aluminium coil, Aluminium foil, Aluminium strip, Aluminium circle, Aluminium tread plate, Aluminium embossed sheet, Aluminium mirror sheet, Color coated Aluminium coil, Aluminium heat transfer plate, etc. In order to move with the times, HWALU keeps introducing the state of the art equipment and technique to improve its competitiveness. At present, there are 16 cast processing lines, 3 CC processing lines, 1 DC processing line, 3 cutting machines, 2 slitting machines, 1 tension level machine, 20 annealing furnaces, 3 punching machines , 2 coil casting lines, with 2 matched vertical and 1 horizontal slitting machine. Now our main products include aluminum Coil, Sheet, Plate, Circle, Strip and Foil, with the annual output more than 200,000 MT and Export volume accounts for 40%. With the continuous efforts, we have got some achievements in the past years. The Max. width of aluminum coil reaches 2,200mm, and the quality can both satisfies European and American Standard. 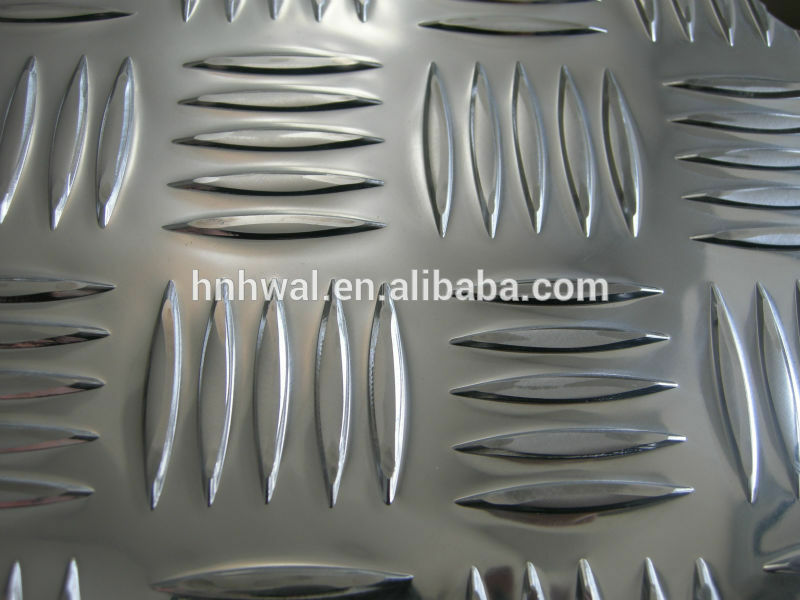 HWALU now can provide over 15 different patterns of Checkered and Embossed Sheet/Plate. Customization with new patterns is also acceptable. The reflectivity of aluminium Mirror Sheet is over 80% with superior performance. Our Self-developed slitting & chamfering machine guarantees the aluminum Strip without any burrs, which is widely applied for dry-type transformer, cable and other industry. Moreover, the Min.width now can be 30mm. With the introduction of full-automatic lines, our annual capacity of aluminum Circle reaches 8,000 mt,and the diameter from 90 mm to 1,200 mm. As the process and technology being gradually perfect, our aluminum Foil 8011/8021 for thepharmaceutical packaging industry has been acquiring more and more reputation worldwide. In2014, HWALU brings in 2 oiling machines for foil 3003 to develop the market in food container making. Considering the superior products and the vibrant market, HWALU set up its CNC workshop in 2013. Now the technology of Stamping, Punching, Welding, Bending, etc are all available. With the accumulation for more than 15 years, HWALU has established its Brand in domestic and abroad. At the present stage, our development strategy is to launch International Trade in a more cost-effective manner. So we cherish all the real feedback from our customer, dedicate to providing the clients with satisfactory service and strive to improve our production quality and efficiency. "QUALITY IS SUPREME, REPUTATION GOES FIRST" is our objective. Products Henan Huawei Aluminum Co., Ltd.
Key figures Henan Huawei Aluminum Co., Ltd.
Executives Henan Huawei Aluminum Co., Ltd.
Activities Henan Huawei Aluminum Co., Ltd.
Video Henan Huawei Aluminum Co., Ltd.
Catalogue Henan Huawei Aluminum Co., Ltd.